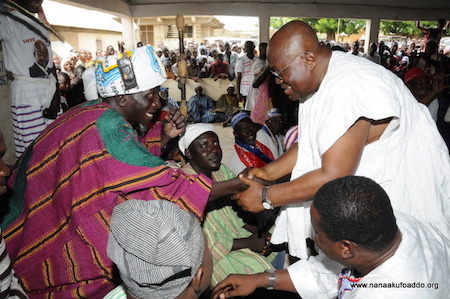 The 2016 presidential candidate of the New Patriotic Party, Nana Addo Dankwa Akufo-Addo, has made a passionate appeal to the people of the Upper East region to disregard the predictable tribal campaign that will be waged by President Mahama in the 3 Northern Regions in the run-up to the 2016 presidential election, just as was done in 2012. Nana Akufo-Addo made this known on Friday, September 18, when he rounded off his 2-day tour of the Upper East Region, in a meeting with members of his party in Bawku. According to Nana Akufo-Addo, considering the abysmal record of President Mahama, the only hope of winning votes from the people of the 3 Northern regions would be to, once again, play the tribal card. “Next year we are going to be told in this part of our world that somebody comes from here, you should allow him to continue. To continue to keep us in the mess we find ourselves in now? Does that make sense for us?” the NPP flagbearer asked. In addition to playing the tribal card, Nana Akufo-Addo indicated that President Mahama and his party will throw in all kinds of goodies, like bags of rice, flour, motorbikes and bicycles, to be distributed next year to poor people. “At the end of the day they get hold of the power and leave us in the situation which we find ourselves in, with no hope. We can’t afford to do that again. As far as I am concerned, it isn’t where you come from that matters. It is what you can do for the people of Ghana, that’s what matters. If you come from an area and you can’t perform and people go hungry because of you, what is the essence of keeping you in office? That campaign is coming,” he warned. The 7-year tenure of the NDC government, according to Nana Akufo-Addo, has been characterised by economic hardships, despondency, rising cost of living, widespread corruption and rising unemployment. In furtherance to this, he noted that “you don’t see many smiling faces in Ghana today because the economy has gone down, and the circumstances of our country today are bad. Farmers can’t afford their fertilizer, so the output from our farms, year after year, continue to decline under the NDC. Businesses are folding up because the private sector no longer has the confidence to be able to invest and expand businesses. Enterprises are folding up and closing. In view of this Nana Akufo-Addo told the gathering, made up of regional and constituency executives, as well as all newly elected parliamentary candidates and their competitors from 6 constituencies in the region, that Ghana must work again. The constituencies were Bawku Central, Pusiga, Zebila, Bunduri, Garu and Tempane. 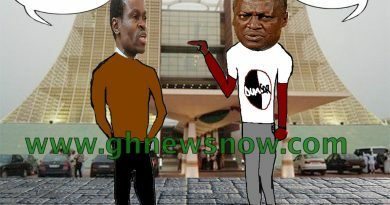 The only people who can put back the smile on the faces of Ghanaians, he said, are members of the New Patriotic Party. “We are the only people capable of doing it, and mobilising the people to build our country once again. That is why I have called this tour the rise and build tour. If we get the victory, we know what to do. President Kufuor showed this country what can be done by purposeful leadership. He took Ghana out of a HIPC state into a Middle Income Country. We will build on his achievements, expand it and bring the prosperity that the people of Ghana deserve,” he added. He was accompanied by the National Women’s Organiser, Otiko Afisa Djaba; former Minister of Trade and Industry, and former MP for Offinso North, Dr. Kofi Konadu Apraku; former Minister of State under President Kufuor, Elizabeth Ohene; Political Assistant, Francis Asenso-Boakye; Press Secretary, Eugene Arhin; Campaign Aides, Iddrisu Musah ‘Superior’ and Pius Hadzide; together with regional stalwarts like Alhassan Samari, former Upper East Regional Minister and parliamentary candidate for Garu; Dr. Gyesika Agambila, a former Deputy Minister of Finance; and NPP Upper East Chairman, Murtala Mohammed.